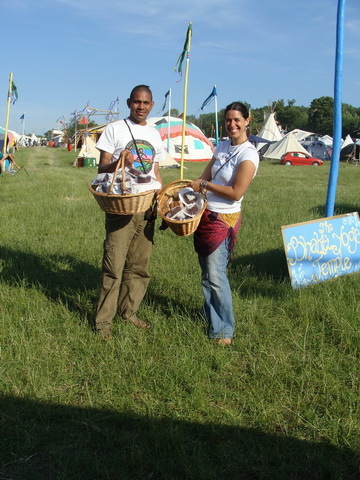 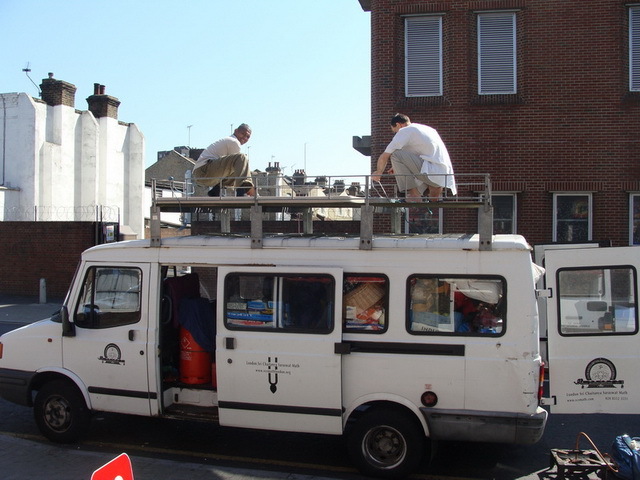 Ritu Raj Prabhu from Venezuela and Giridhari Prabhu from Hungary pack the bus with all the things necessary for a week's stay at Glastonbury festival. 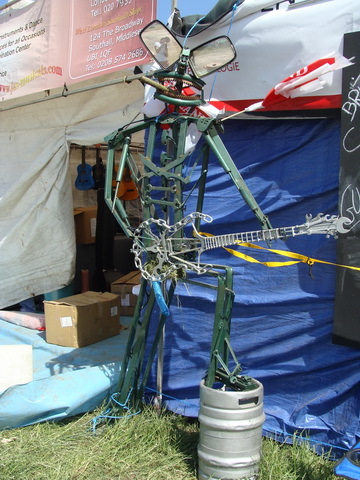 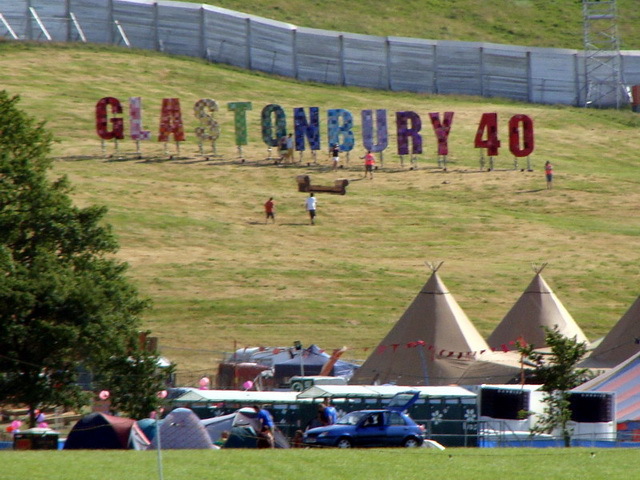 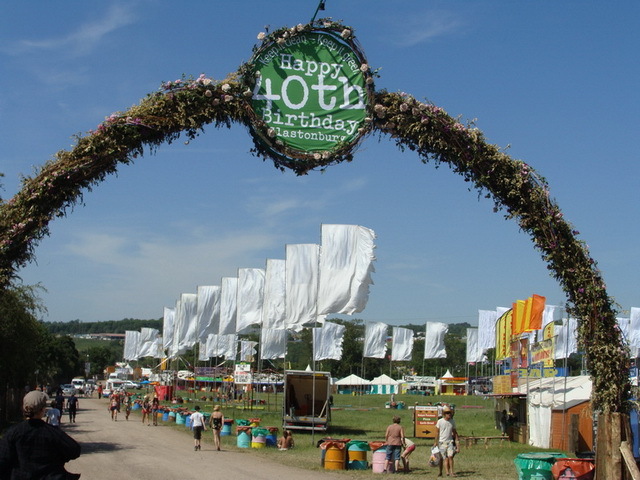 Glastonbury festival is celebrating its 40th birthday, running annually since 1970. 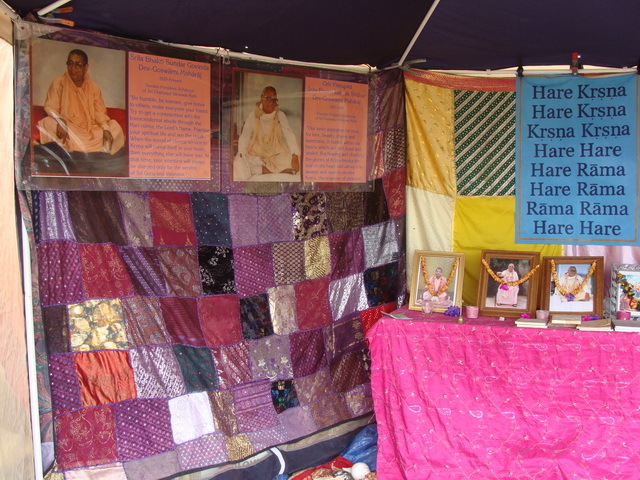 There is a marvellous team of international devotees participating in this year's fundraising activities at this festival. 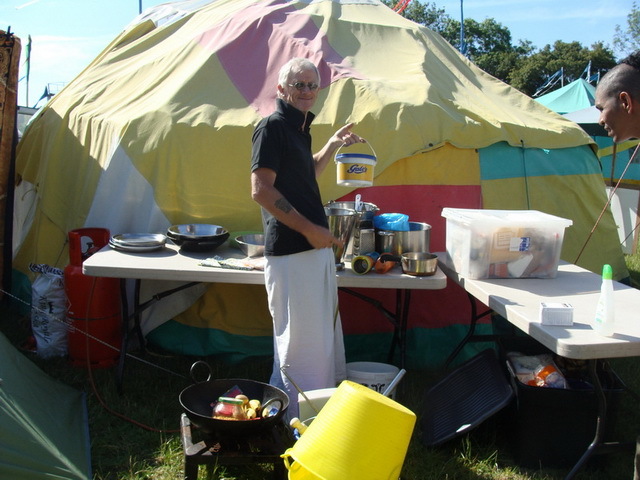 Dandakaranya Prabhu from Wales is the team's fabulous cook! 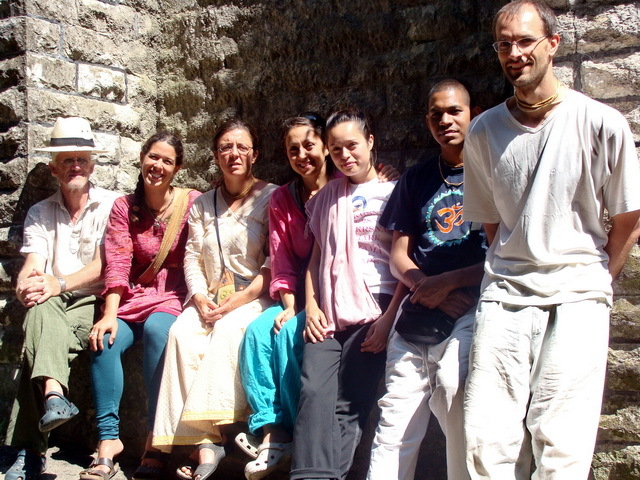 Saraswati DD (right) from Venezuela leads the team of therapists. 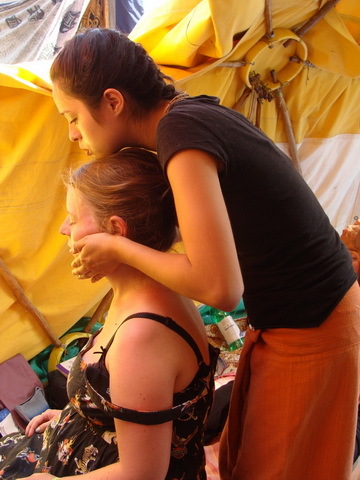 On the left is Malini DD from Malta, practising Ayurvedic Massage and Indian Head Massage. 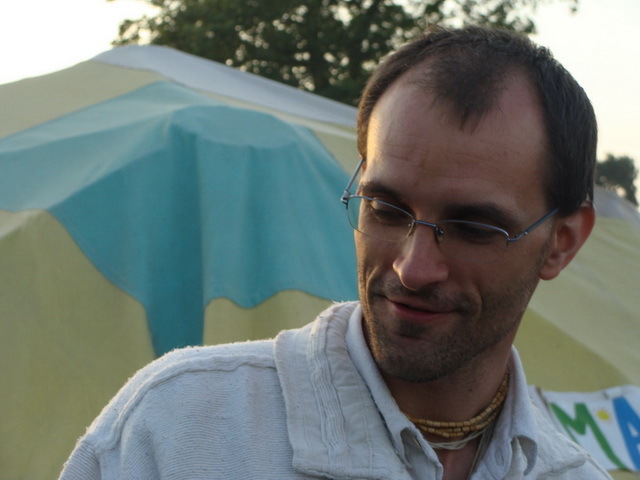 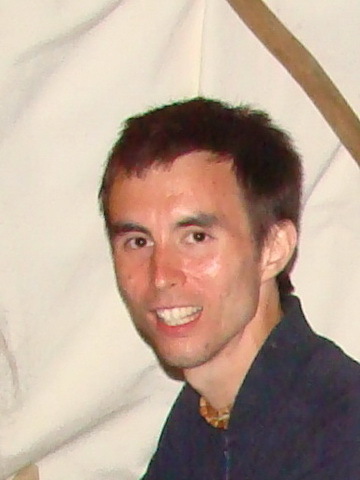 Giridhari Prabhu from Hungary is the Thai Massage expert. 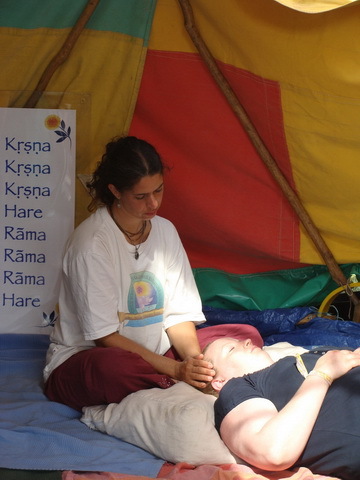 Radharani Dasi from Mexico practises Oriental Massage. 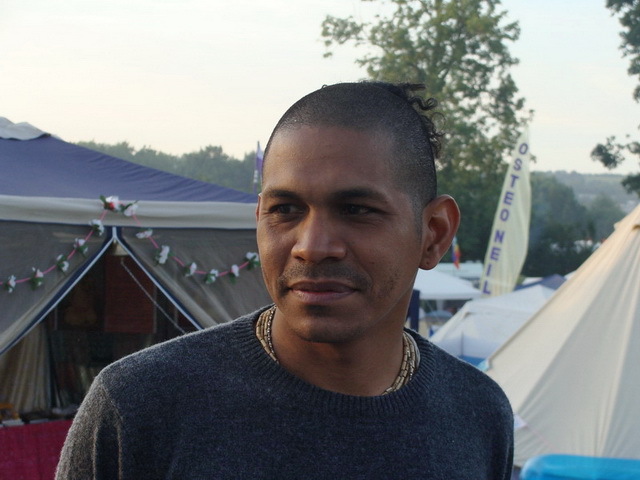 Ritu Raj Prabhu from Venezuela also does Oriental Massage. 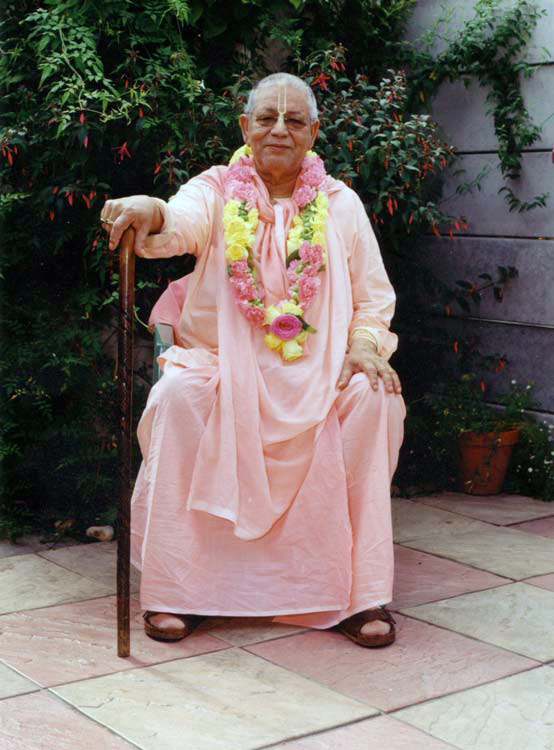 As does Lalita Madhava Prabhu from Singapore/UK. 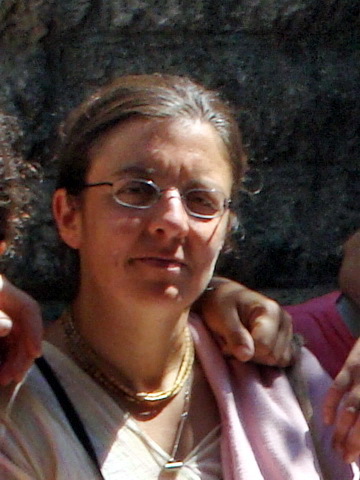 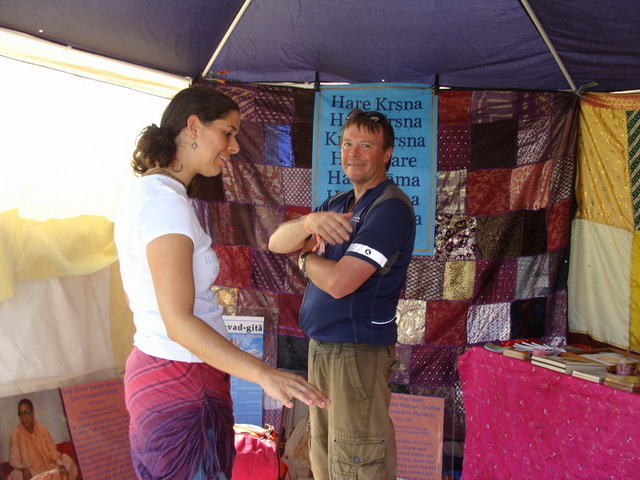 Rasamoy Pandita DD from Holland is the Hostess/Receptionist, who plans the therapists work. 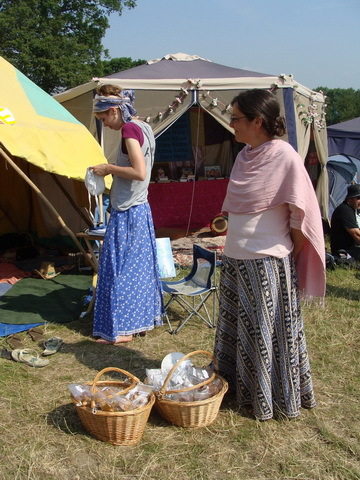 And Lavanya DD is the event organiser and collector. 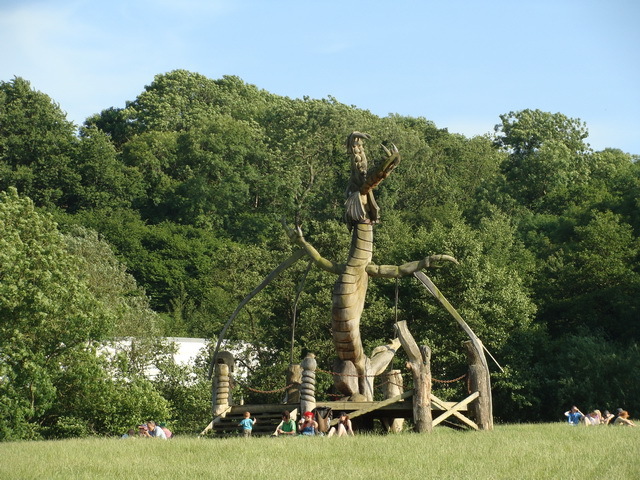 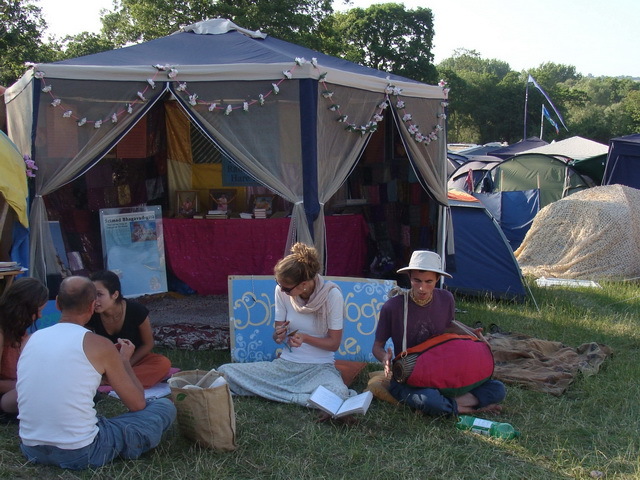 Inside the festival grounds, we are allocated a strategic spot in the Healing Fields, in the Green Fields area. 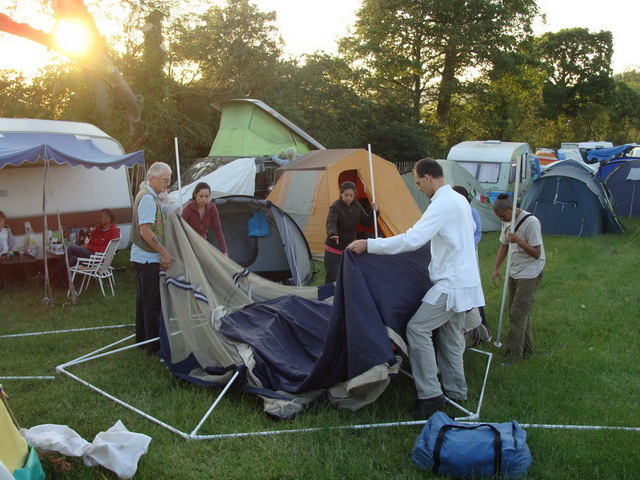 We arrive on Monday, and after a long drive pitch all the tents. 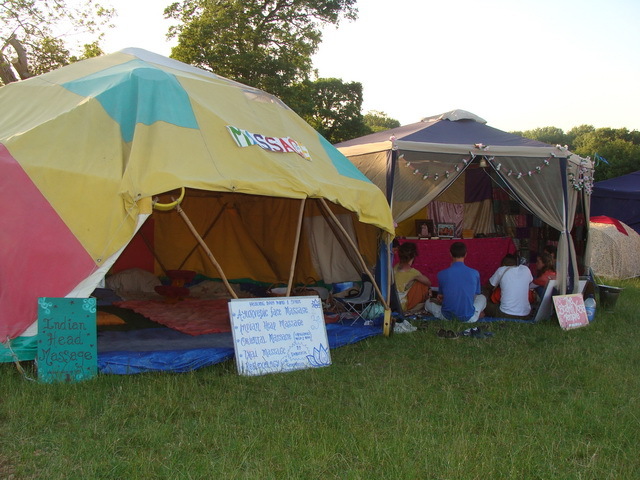 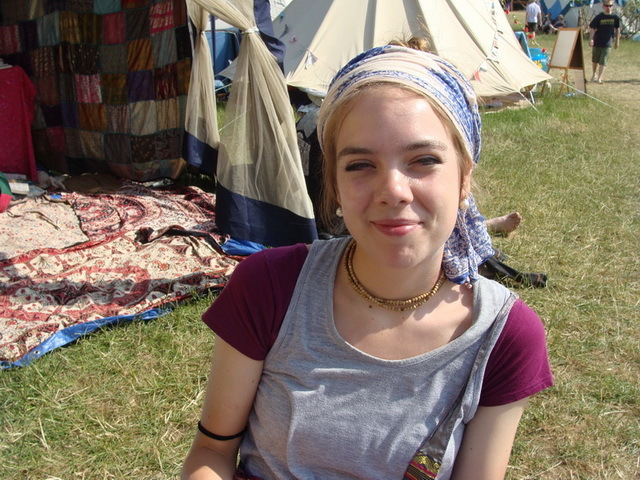 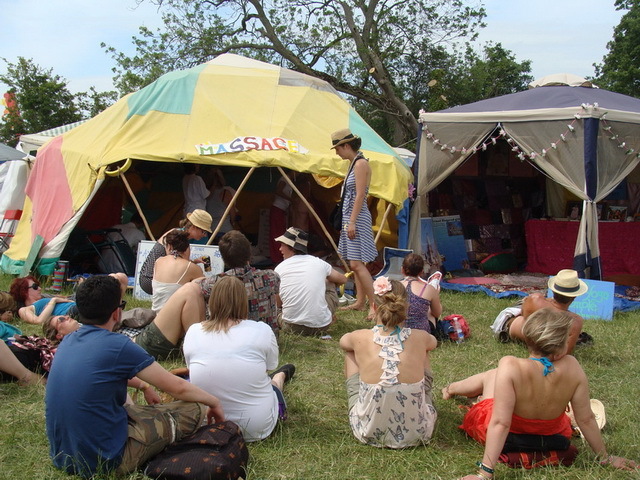 The festival organisers allocate a lovely dome for us as the massage tent, and we set up a Temple tent just beside it. 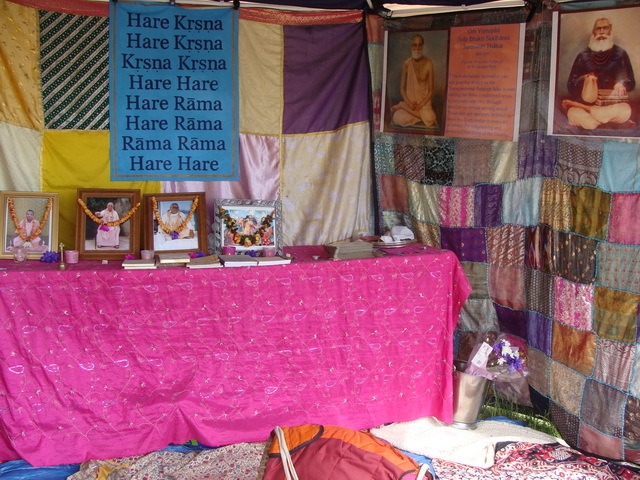 Our beautiful Temple tent is very inviting as a spiritual refuge for all. 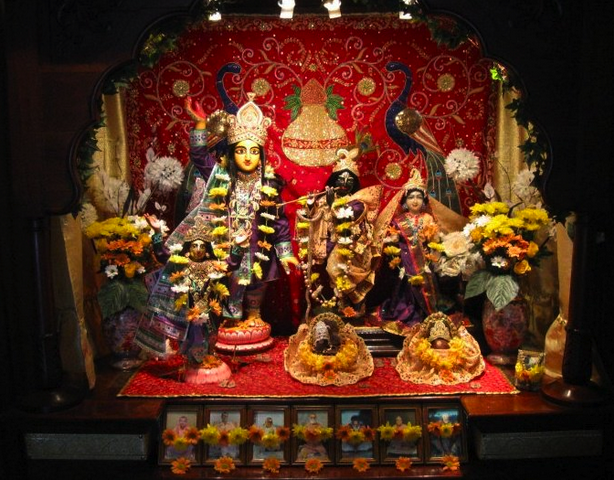 Our guardians watch over us and the Mahamantra is displayed to inspire all guests and to identify us as servitors of Sri Sri Guru and Gauranga. 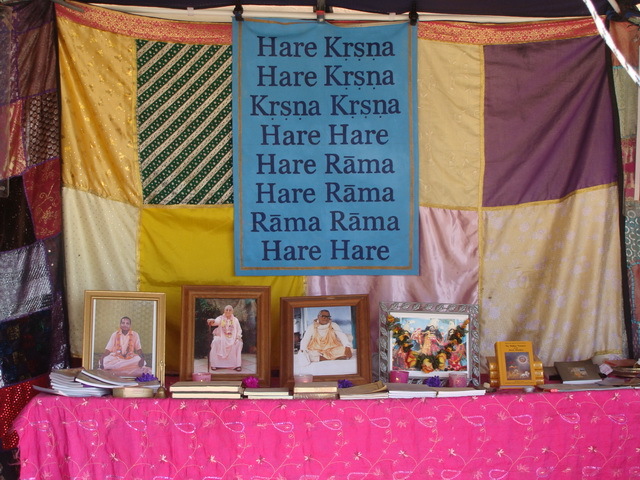 Words of wisdom are displayed to provide inspiration to all seekers. 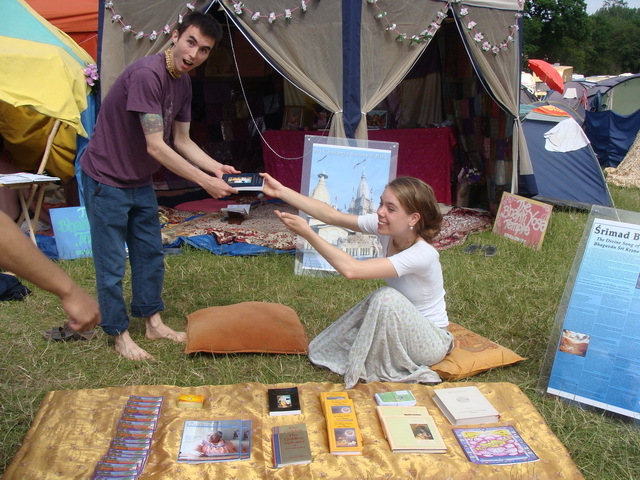 Lalita Madhava Prabhu and Rasamoy Pandita DD organise a book distribution and preaching initiative. 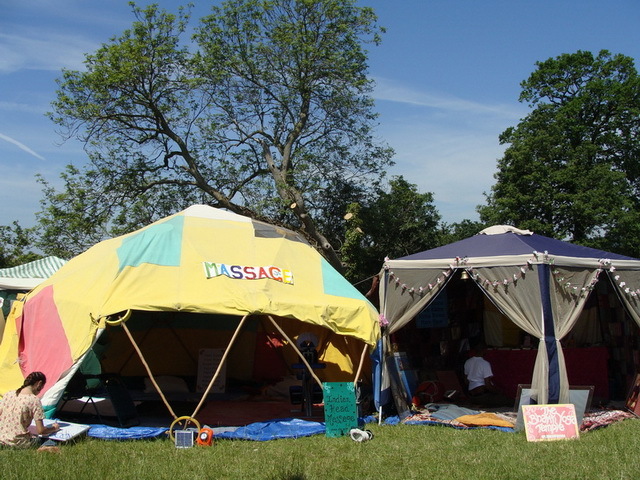 Sometimes a massage patient would enquire about who we were and what we did so an opportunity would arise to share more about our Mission. 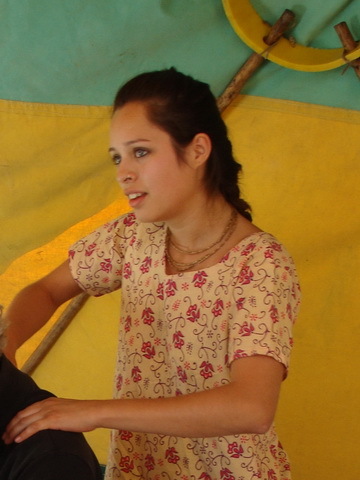 Sometimes Malini DD would hit the preaching field. 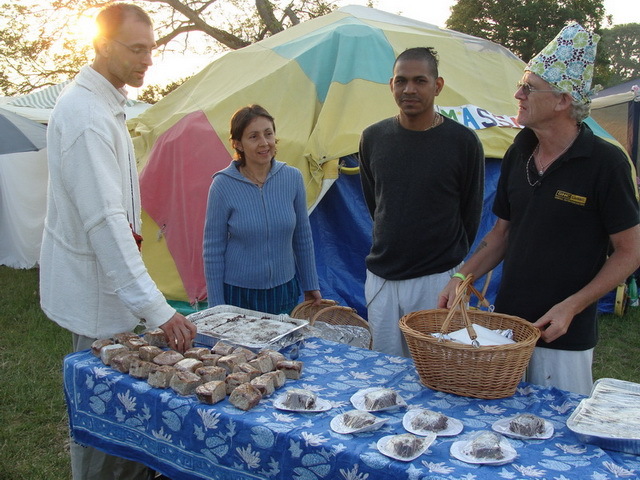 All devotees participate in Sankirttan activities as opportunities arise, and prasadam is freely distributed. 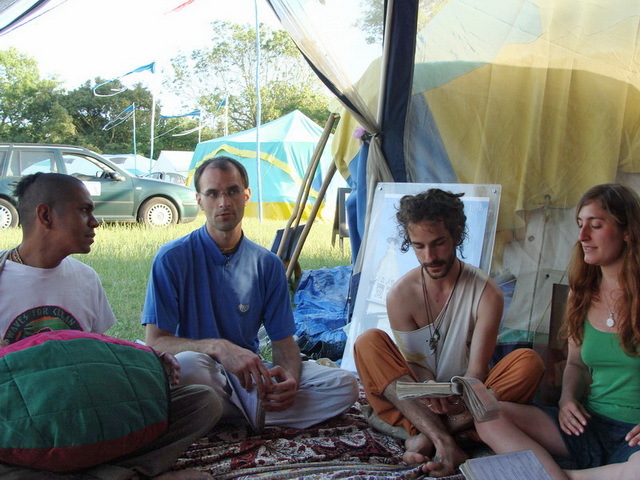 Behind the scenes Dandakaranya Prabhu is the star of the kirtchen. 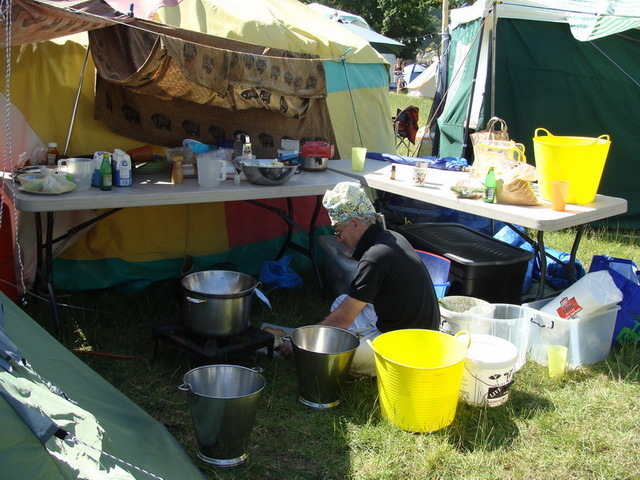 His preparations are irresistable to everyone! 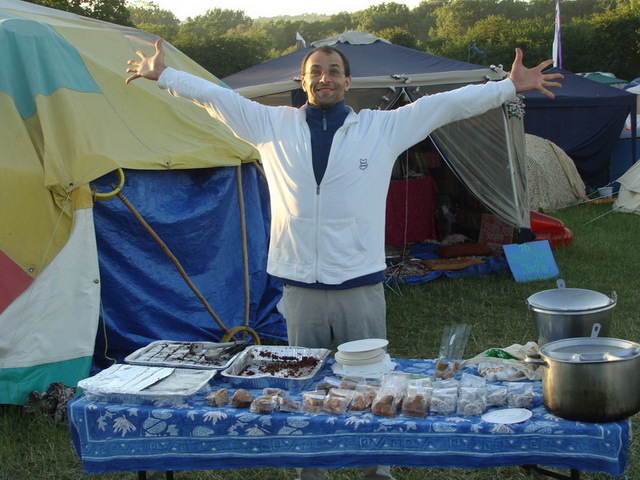 The cake table turned into another successful fund-raising venture. 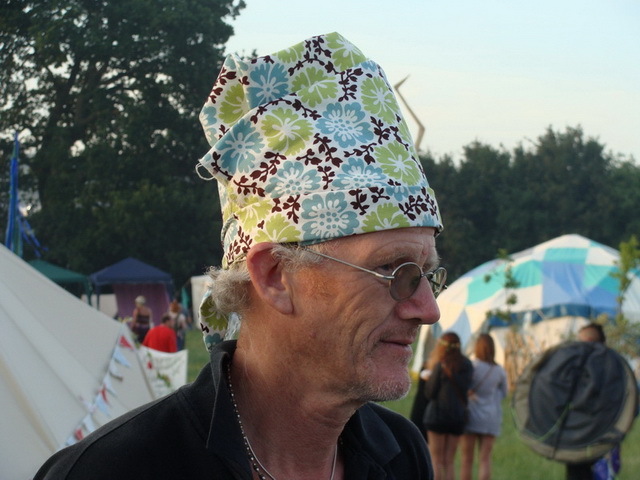 "The cakes are THIS good!" 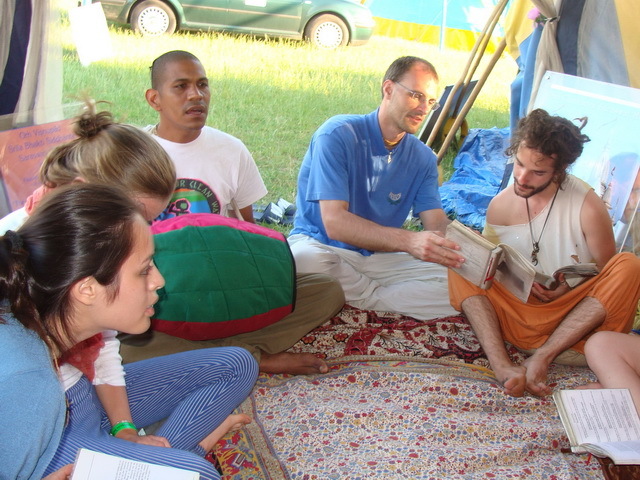 says Giridhari Prabhu! 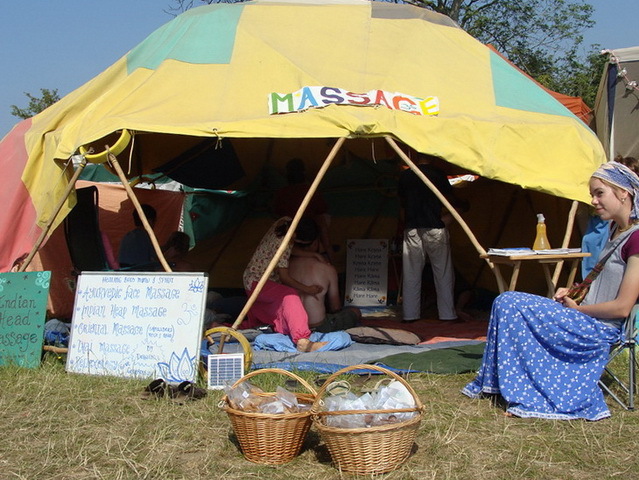 The main fundraising activity, however, is the performance of holistic healing therapies, which has crowds gathering outside the tent. 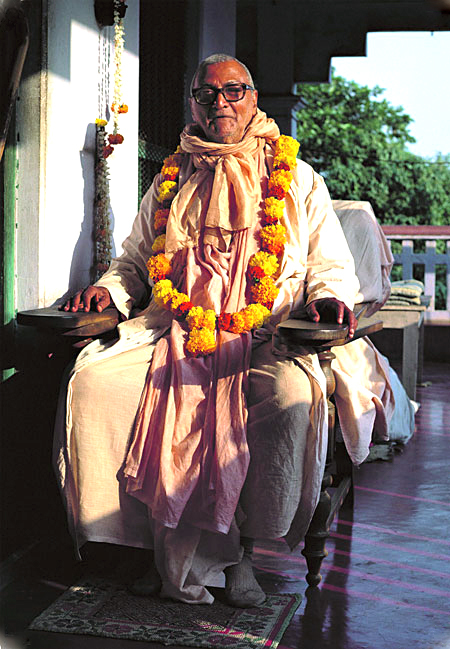 Some people wait up to two hours for their turn, until Rasamoy Pandita begins to organise the half-hour time slots so people could go away and return for their appointment. 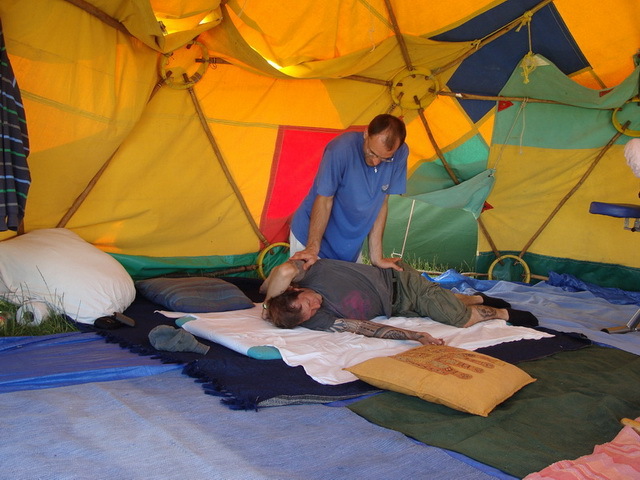 Various holistic healing techniques are practised by the devotees - here Thai Massage is demonstrated. 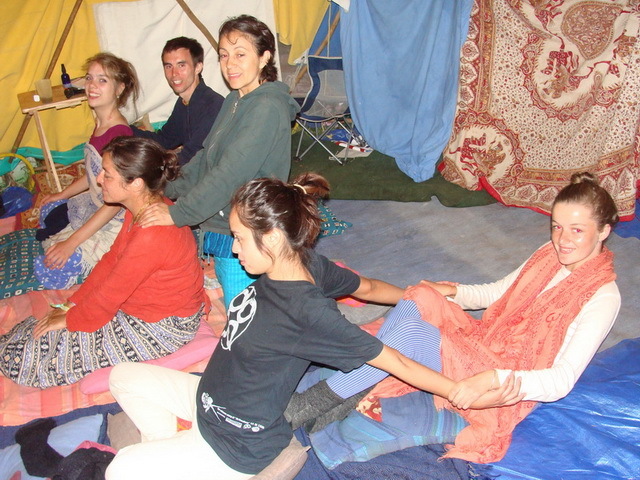 After hours the devotees enjoy exchanging and learning from each other. 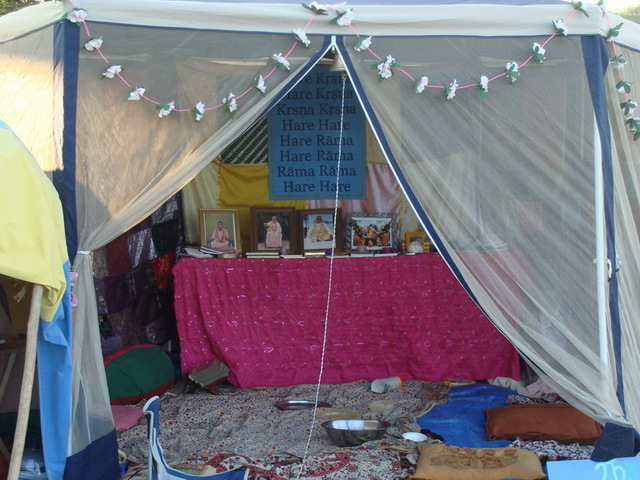 Day after day for five days, all the devotees endeavour to give their healing services for 9 hours a day or more. 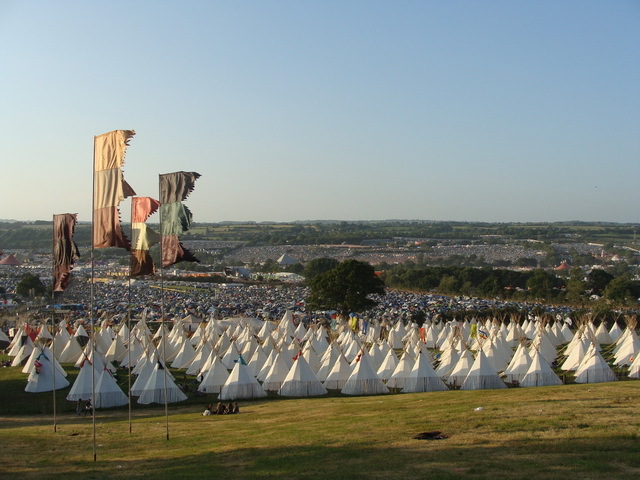 The festival grounds are huge... 8 km in circumferance and containing approximately 200,000 people! 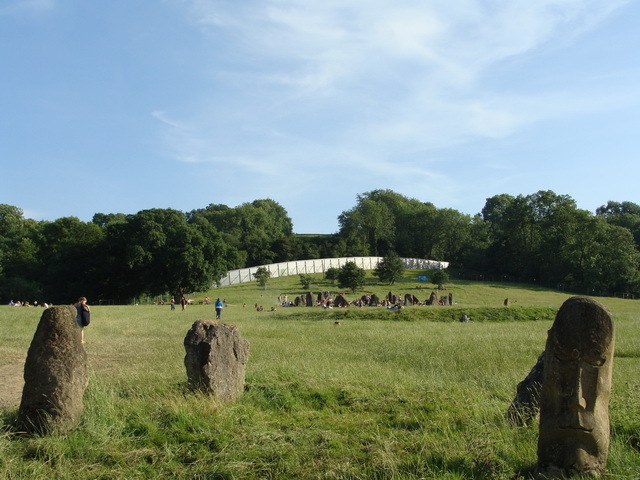 This ancient stone circle is within the grounds. 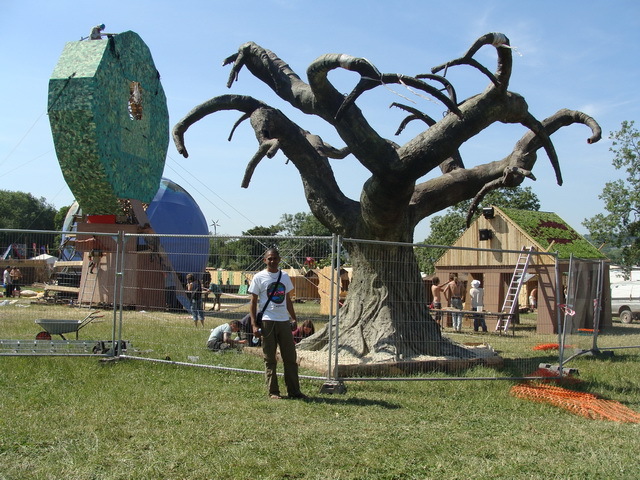 The place is strewn with an array of sculptures and artifacts. 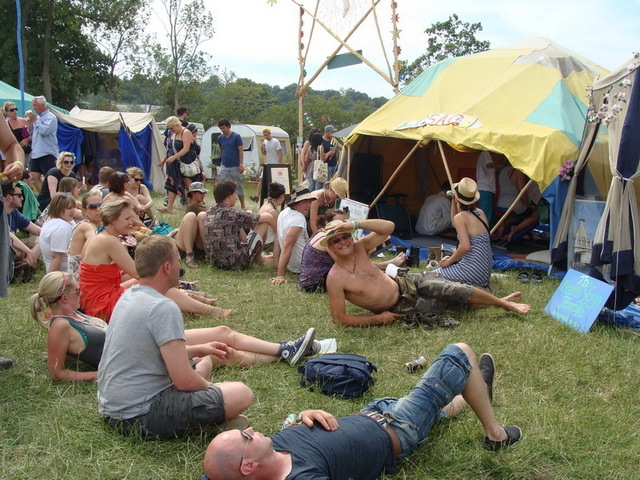 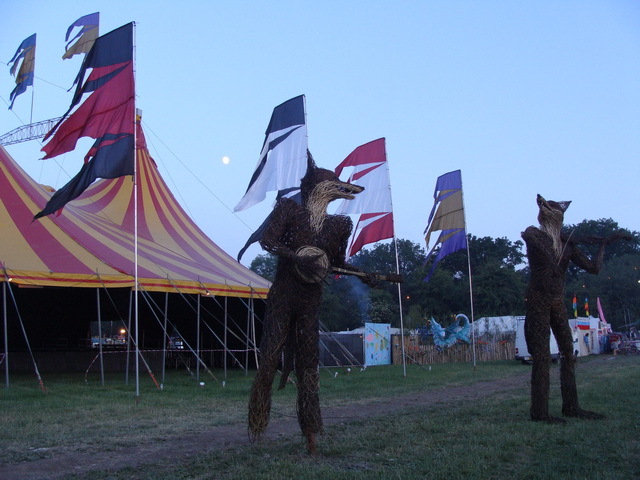 Many large tents host stages for music, theatre and all kinds of entertainment. 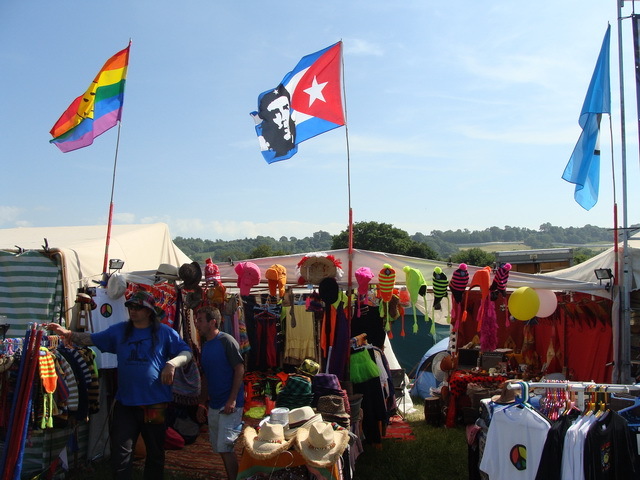 And there are shops selling all kinds of objects imaginable. 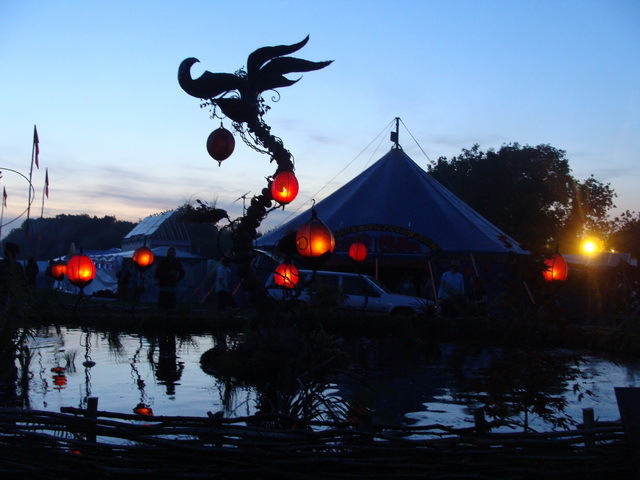 Everything possible is done in such a fashion as to create a magical atmosphere. 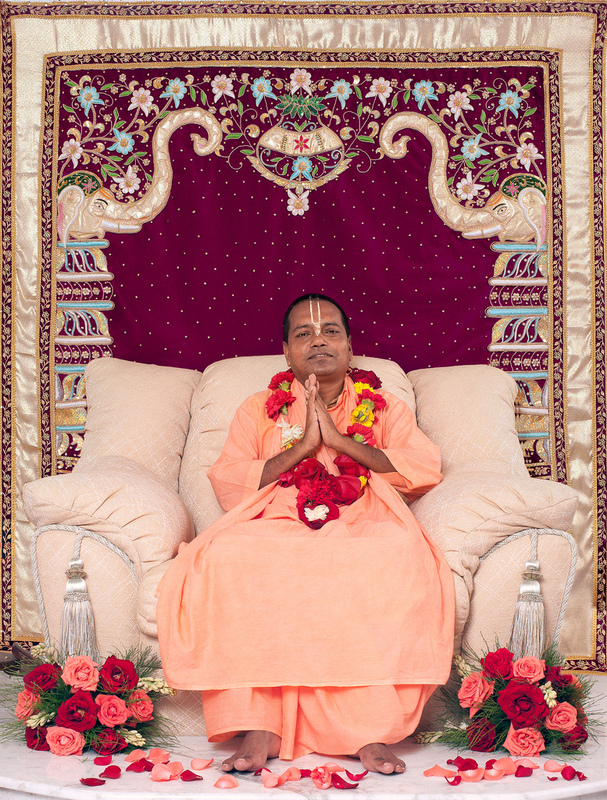 But to the devotees, nothing compares to the joys of serving Sri Sri Guru Gauranga Radha Shyamasundar! 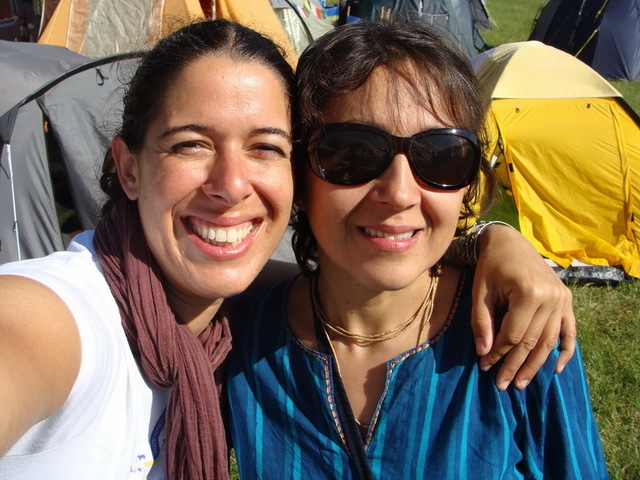 hi to Lalita and Pandita whom I have met at a Sunrise gathering (Lalita we discussed a 4hero record?) 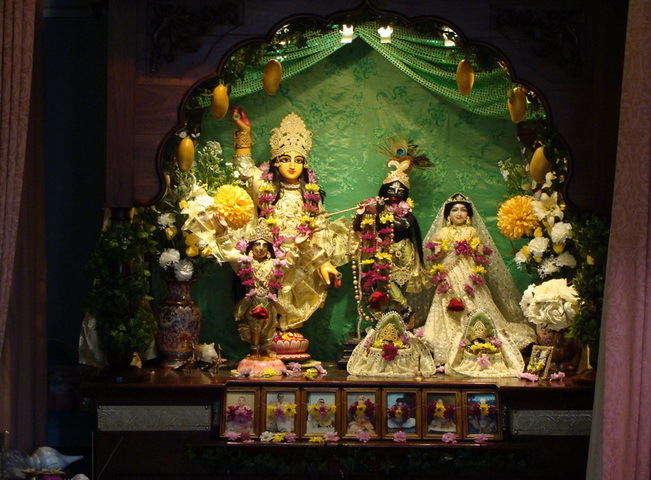 Perhaps i could come visit green street sometime/ for Radha’s Appearance this week?